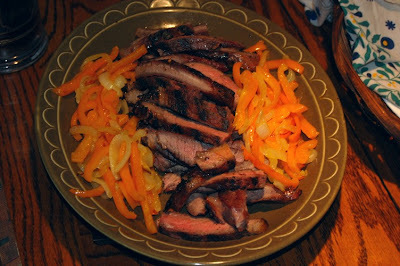 I went looking some time ago for a really traditional fajita recipe. Actually the only real recipe you need is for the marinade as everything else is just straightforward. After sifting through many many marinade recipes I finally came across one that was supposed to have originated in Northern Sonora in the 1920's. It blends in at least 2 ingredients that definitely mark it as Norteño cuisine, Red Wine Vinegar and Worcestershire Sauce. You can use any cut of steak you wish, but skirt steak is the most traditional although it may be out of the price range of some people (including myself). I chose to use Organic Sirloin and it came out excellently so don't be too worried about using a cut other than skirt steak. You will need to grill the steak to get the optimal flavor. Mix all ingredients together and pour over beef. Marinade 6-8 hours. When ready, grill steak until med-rare. Allow to rest 6 mins before slicing. Serve with sauteed peppers and onions, diced tomatoes, shredded lettuce or cabbage, sour cream and hot sauce (Cholula is my favorite). Use Flour Tortillas Recipe. *A Few Notes on Specific Ingredients: You can use fresh squeezed lime juice but I had Nellie & Jacob's on hand it is a most excellent fresh lime juice compared to the "made from concentrate brands. Alcohol may be any white liquor, white tequila is traditional but I used white rum that I had on hand and had excellent results. Red Wine Vinegar should have 2 ingredients in it, wine and vinegar mother. Vinegar is naturally stable and does not need Sodium Benzoate as a preservative. I shy away from any brand of vinegar that uses it (or any preservative) and I recommend you do the same.